Pioneer settler in the Albemarle, about 1662. Speaker of Assembly. Site of home 20 miles east, at Durant's Neck. 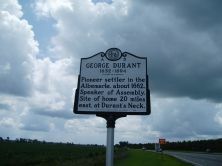 Statesman, explorer, rebel—George Durant (1632-1694) was one of early North Carolina’s most prominent leaders. As one of the first settlers in the Albemarle region, Durant became a mainstay in her politics, serving the Lord Proprietors as attorney general just two years after leading an insurrection against them. Through his leadership, Durant was instrumental in establishing local government in an area overlooked and underappreciated by the Proprietors in London. Little is known of Durant’s childhood, save that he was raised in England and in 1660 traveled to lower regions of Virginia to explore new territory for speculation. During the course of his excursions, Durant befriended fur trader and mariner Richard Batts, with whom he witnessed the first documented North Carolina land purchase, from the King of the Yeopim to Richard’s brother, Nathaniel in September of 1660. Durant himself would purchase land in Virginia from the Yeopim in 1661 and 1662. By the year 1665 Durant was already a pillar in the settlement’s social and political institutions. As new settlers arrived in Carolina, the Lord Proprietors shifted their attention to matters in the prosperous port of Charles Town at the expense of the Albemarle region. In response, Durant sailed to London to represent the interests of the Albemarle, which were suppressed at the whims of proprietors. Durant advised the proprietors against neglecting the economic and political needs of his “backwater” region, as revolt was an ever-present threat. His words were disregarded, and by December of 1677, conditions in the Albemarle region were such that Durant felt compelled to lead an insurrection against acting governor Thomas Miller, who assumed the gubernatorial seat without permission of the proprietors, was imposing heavy fines on colonists. The subsequent overthrow and imprisonment of Miller is known as Culpeper’s Rebellion, because the rebels named John Culpeper as temporary governor of Albemarle. He was later deported to England to face charges of treason, but after the Lord Proprietors discovered Miller had acted without permission, all charges against Culpeper were dismissed. 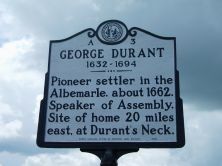 Two years after he rebelled against the proprietors in London, Durant was one of the most influential politicians in the region, due largely to his success in protecting the interests of Albemarle and Carolina. In 1679, Durant was appointed speaker of North Carolina’s first legislative assembly and also served as attorney general under Thomas Harvey. George Durant died in 1693 or 1694, according to his will, which his wife, Ann Marwood Durant, administered.